Scandinavians are fond of saying, "There is no bad weather, only bad clothes." That's an appropriate attitude for New England. You have to learn how to deal with winter weather in order to enjoy life. Since the late 90's, I've been doing winter backpacking, ice climbing, and frostbite sailing, passing those cold weather skills on as a Boy Scout Assistant Scoutmaster and Scoutmaster for 9 years. I've gotten used to gearing up with the appropriate clothing for heavy conditions. In the two months since I started my new job, taking the commuter rail in to Boston, we've had the full gamut of New England winter weather, with wind, rain, ice, sleet, snow, slush, puddles, and muck as the temperatures ranged between 3 degrees F and 58. Right around the solstice, it was dark when I walked to the station in the morning, and dark when I walked home in the evening. It's a 15-minute walk each way, plus I allow an extra 5 minutes of slack, so I'm spending at least 20 minutes out in the weather. Sometimes the train is anywhere from 2 to 25 minutes late. The roundtrip walk comprises a major portion of my exercise each day, a bit over 2 miles total after adding the distance from the T subway station in Cambridge to my office. I didn't want the weather to get in my way, so I invested in some commuter foulies. My winter sailing foulies are a bit too bulky, although they would have served well enough. I wanted something I could pull on and off over my office clothes easily. The secret to cold weather comfort is the three-layer system. This is a skin layer, an insulation layer, and a shell layer. As I used to tell my Boy Scouts, protect your warmth and your dryness. The skin layer is the cloth in contact with your skin, so you want comfort to the touch. For physical activities, it should also wick the moisture away from the skin, since sweating produces a lot of internal moisture. The insulation layer is what provides the heat retention. It may actually be composed of multiple articles, like several layers of shirts and sweaters. You can add more if you get cold or remove some if you get hot. The shell layer protects against wind and wet. It should be a breathable material that allows internal moisture vapor to escape, while keeping external moisture droplets out. The wind protection prevents the wind from blowing away the heat accumulated in the insulation. The shell is just a thin layer that doesn't provide much warmth on its own. For outdoor activities that may go for hours or days, this usually means long underwear tops and bottoms, fleece tops and pants in multiple thicknesses, and shell jacket and bibs or pants, plus heavy socks and insulated boots. And hat and gloves. This all has to be tuned to the activity level at the moment. On the sailboat, that ranges from standing still on a long tack in the full force of the wind to mad activity hoisting and dousing sails. Backpacking, it ranges from hanging around camp at night to snowshoeing with a 50 or 60 lb. pack, where I usually end up stripping down to just a couple of light layers, throwing it back on immediately when I stop for a break. Ice climbing, it ranges from standing at the bottom belaying the climber, to working hard climbing up a frozen waterfall with ice axes and crampons as the heart goes pitter-patter. This all requires some adjustment for commuting to work. I may encounter much the same conditions, but it's only for 20 or 30 minutes. Since I don't want to get all sweaty, I keep the activity level at a moderate walking pace. My regular office clothing acts as skin layer, with a sweater or fleece as insulation layer. 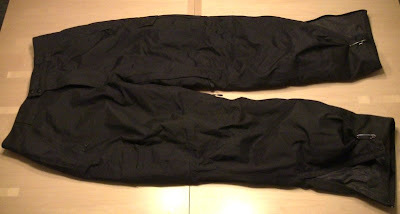 I already had a decent Columbia/Sorel shell jacket suitable for wearing to work, so I added a pair of EMS rain pants for rainy days, and a pair of EMS insulated snow pants for cold and snowy days (Amazon sells similar Columbia jackets , Marmot Rain Pants , and Columbia insulated pants ). I got one size up so they would go on over my pants easily, though that meant I had to blouse the cuffs with safety pins so they wouldn't drag on the ground. 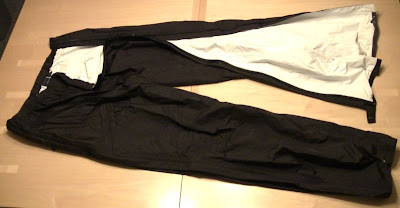 The rain pants have full side-zips, which helps a lot getting them on and off. Footwear posed a challenge. 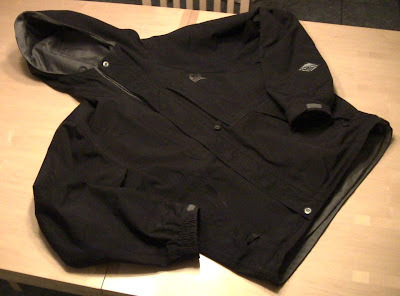 I wanted something totally waterproof as well as warm, plus comfortable for urban walking. I got a pair of Bogs Men's Classic Ultra Mid neoprene-insulated rubber boots that slip on easily; I keep a spare pair of shoes at work to change into. Since the streets and sidewalks are sometimes frozen up, especially the first few days after a snow, or when the temperature is above freezing during the day and below at night, I got a pair of Yaktrax ice walkers to go on the boots. 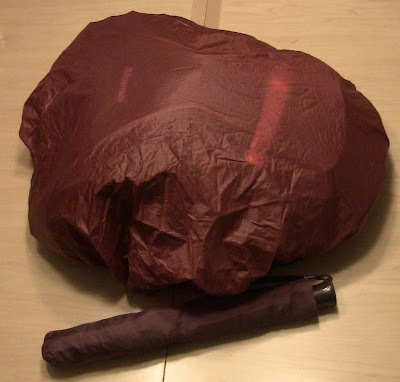 For the rainy days, I added a collapsible umbrella and a small Sea to Summit Pack Cover . Since I'm walking along the streets in the dark, in the fog and the rain and the snow (and all my shell layers are black), I hooked two Nite Ize Clip-On LED Markers to my pack, on the back and on one strap. Ok, so I look like a safety geek, but I won't get run over because someone couldn't see me in the dimness. Shell jacket with hood to keep the wind and wet off my upper body. Rain pants to keep the wind and wet off my legs. Insulated snow pants. With my work slacks as skin layer, these act as insulation and shell layers. Bogs boots, scarf, Yaktrax, hat, gloves, and 180's ear muffs with built-in headphones. Pack with rain cover and mini umbrella. You can see the NITE IZE reflector glowing underneath; it shows up quite well in the dark. Not weather-related, but of course no modern rail commuter is complete without laptop, e-reader, smartphone, and music player. 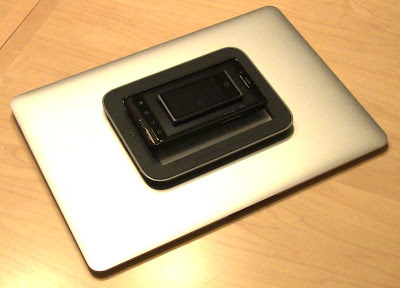 This is enough compute power to control a space shuttle mission. Pyramid-o-technology: iPod Nano with built-in FM radio so I can listen to NPR on the walk, Droid phone so I can keep in touch and check the online train status, Nook Glow e-reader so I can read on the subway, and MacBook Air so I can work on the commuter rail (offline, since the WiFi service is currently so unreliable as to be useless). Actually, fully suited-up, with hat and scarf under my hood and gloves on, I look like I'm wearing a space suit, ready for EVA orbiting the dark side of the moon. 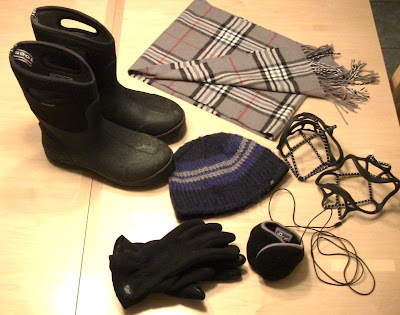 But in this getup I'm impervious to whatever the New England weather dishes up, tromping through puddles or snow drifts with impunity, ignoring the wind-driven precipitation. I've had occasion to use all of it, so the expense was worthwhile. I can handle anything short of hurricane, tornado, flood, earthquake, volcanic eruption, or breach in the space-time continuum. Those things usually disrupt the train service anyway. I enjoy your web site very much. I am looking for more info on the furniture project. Every time I go to the web site most of the info I get is for past shows. I am trying to decide which day to go but would like to see some of the demos as well as the designs. Is there a schedule of events for the 2013 show some where? I guess the tie in to your latest post is I am planning to take the train in from Rhode Island. Hi Chris, I've forwarded your comment to the TFP folks. They may still be putting together the daily schedule. And hopefully that will be light weather for travel, since I don't relish the idea of driving my van loaded down with workbenches, tools, and lumber to the show in the middle of a snowstorm! That's another nice thing about the commuter rail, I don't have to deal with the winter driving. Looks like you're quite prepared, Steve. I spend about 1/3 my time outdoors and don't have half your gear. Looks like I'll have to pick some up.